Kyoto, Japan. 26th October 2014. 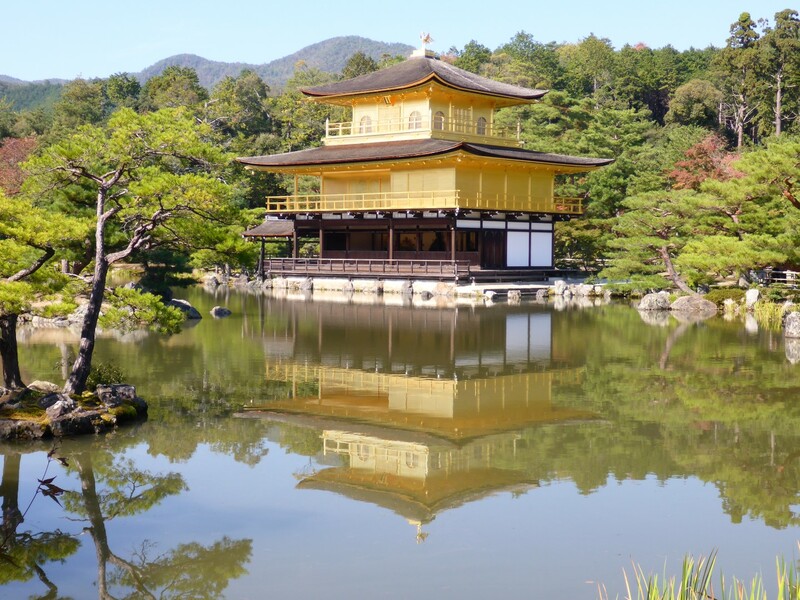 One time capital of Imperial Japan, Kyoto is sometimes referred to as The City of One Thousand Shrines. I was going to be busy! 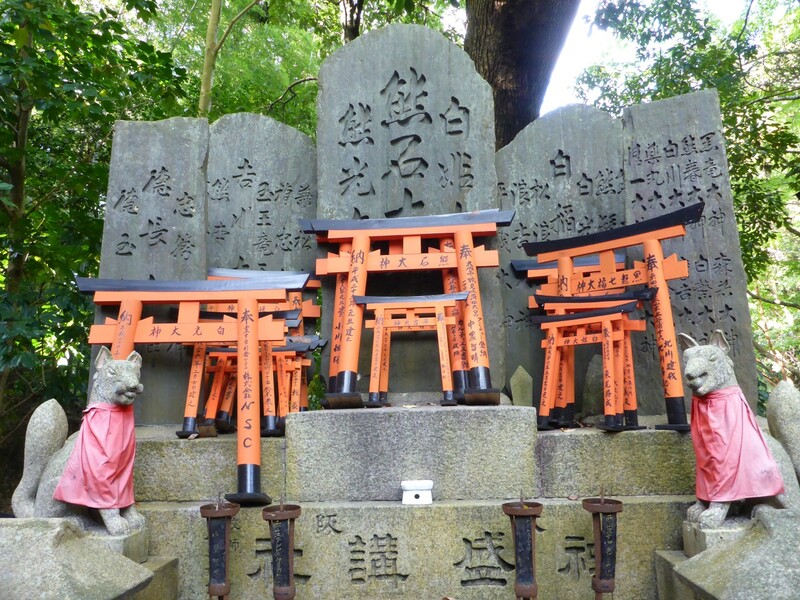 Shinto (Way of the Gods) is Japan’s main religion and is centered on Kami, the spiritual essence of places – rocks, trees, streams, animals, and occasionally people. From its inception in about 660BC until the influence of agriculture, shrine type buildings were rarely used. When people became more settled then buildings became more common and later ones were sometimes influenced by Bhuddhism. 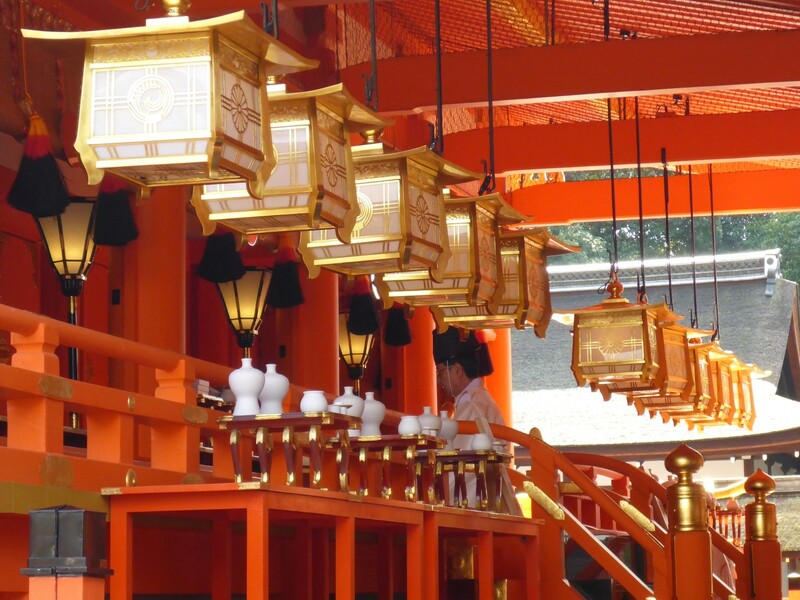 There are certain rituals that you will see performed by visitors to shrines, including ritual hand washing and bowing and clapping in front of the entrance. The basic style of the buildings hasn’t changed much although many of them are rebuilt deliberately as a form of renewal. There will always be a Torii at the entrance to the shrine. It denotes the separation of public from religious space. About 80% of the population follow Shinto traditions, the rest follow Buddhism, Christianity or Islam.. The ride to Kyoto was interesting in many ways. I was on a steep learning curve with regard to road layout, other drivers’ manners and tunnels. Lots of tunnels. Like I said, Japan is mountainous and when the roads aren’t twisting and turning around them they’re running through tunnels beneath them. They all have signs at the entrance telling you the name and length of it. The longest one on that day’s ride was three kilometres. I was impressed! I’d never seen anything like it. I hadn’t been in the tunnel long before my mind started telling me I’d be in France when I came out the other end. The normal roads are all single carriageway and tend to have plenty of markings down the middle, even big studs on some of the bends. It seems that overtaking is very much discouraged. They are narrow, with a 60kph speed limit and the well mannered Japanese drivers stick to it. I tended to get very frustrated and overtook whenever I thought it safe to do so. I went on to an Expressway at one point, where the limit was higher at 80kph although the road was single carriageway. Management of entry and exit slips onto these is pretty much the same as anywhere else. Expressways mostly mean tolls and these would be collected either by machine or at a toll booth. There didn’t seem to be any difference in price between cars and motorcycles and there is an automatic toll collecting system called ETC (Electronic Toll Card). Towns along the route tended to be long and narrow, hemmed in by mountains or because they were in river valleys. They usually had traffic lights every 500 metres or so and progress was slooooow. I made best use of left or right turn lanes to get to the front of traffic queues, which helped to relieve the frustrations a bit. Towns have their uses though, one of them being the plethora of convenience stores within them. As well as the aforementioned Lawsons there were four other common names. The ubiquitous 7/11, MiniStop, Circle-K Sunkus and Family Mart, all providing coffee, snacks and toilets. At one point I stopped at a cafe where I’d seen lots of bikes outside but the riders were just leaving and seemed fairly incurious about the Western biker who’d just pulled up. 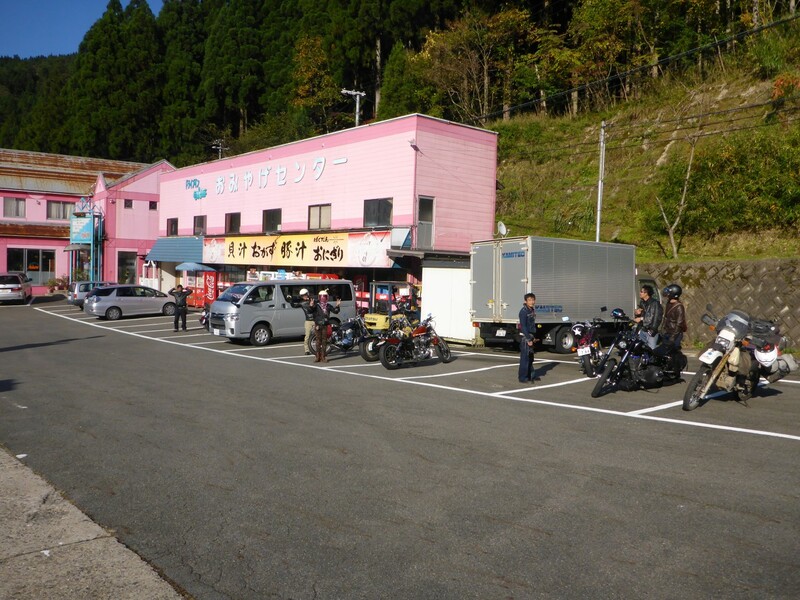 In fact Japanese bikers generally don’t seem to go in for greeting other bikers. Whenever I waved I might be lucky to get a nod, rarely a wave back. But many of them ride Harleys so that might explain it. Sunday riders outside a cafe. The weather was sunny and warm although it was late October, and the trees looked very beautiful in their Autumn colours. But it was dark by 5.30 and I rode into Kyoto on headlights. I’d managed to download some Japanese maps for my GPS but it soon became clear that they weren’t very good for minor streets and, in particular, street numbers. However, with the help of some passers by I managed to find my hostel, K’s House, and got settled in. This hostel is high quality and is part of a chain with a hostel, sometimes two, in several cities. This one has a cafe attached which sells an all-you-can-eat buffet breakfast at around £7. It was worth the money. Sae, my friend Richard’s Japanese wife, had given me a long list of places to visit, gleaned from her extensive knowledge of her country. The list included several places in Kyoto so the next four days was to be spent visiting the sites and seeing the sights. 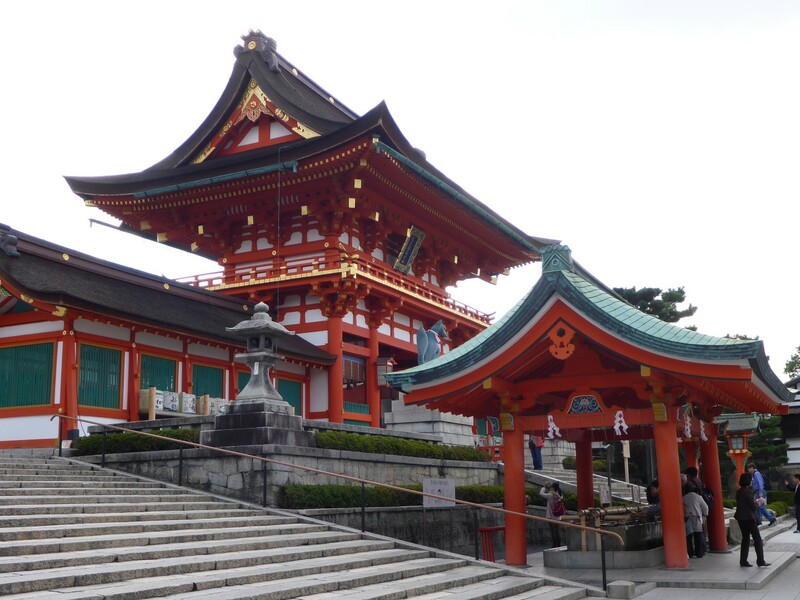 Shrines, temples and castles were on the list. In preparation I made some plans and tried to find the addresses of each one on my GPS. That was a massive fail as none of them were on there. The only solution was to Google the coordinates for them and make a manual entry of the location. This came to be a system I frequently relied on in Japan. Research what to see, download the coordinates, programme the GPS. Although Kyoto has good transport I preferred to ride around on my bike rather than tackle the mysteries that lie within foreign bus systems. But first I needed to shop and a map of Japan was top of the list. The hostel staff directed me to Yodobashi, a big department store, not too far away, which had a large book section. This place was enormous and I immediately discovered something about Japanese life. They clearly love to shop and regardless of which item I looked at, there would be a huge choice, especially in anything related to household goods, electronics or cameras. As an example, one section sold tripods. They were all stood up on the floor covering an area about 5 metres wide by 15 metres long. 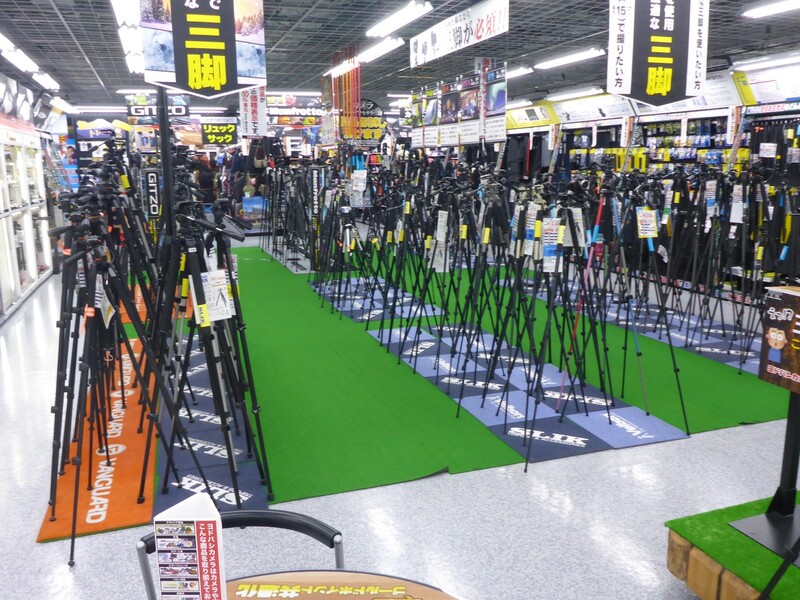 The choice was huge and I really couldn’t understand just how many types of tripod one person might need! I suspected that buying five different items could be a full day’s work. On the plus side there were plenty of polite and helpful staff to assist, who would bow to you as you approached. It didn’t take me long to get in the habit of bowing back and I must say I quite took to the idea, not feeling in the least bit uncomfortable about it. I managed to find a road atlas, in English, although it didn’t include an overview map of the whole country, important for route planning. It broke the country down into sections, with lots of tourist information, larger scale maps and town plans. It turned out to be very effective book. A veritable forest of tripods. 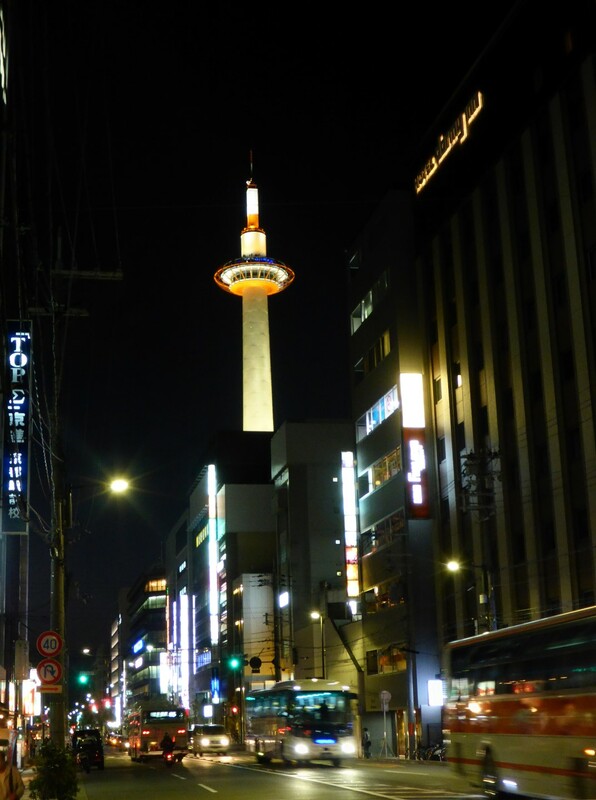 Once I’d got a couple more things that I needed I headed for the Kyoto Tower where I could see over the city from 100 metres above it. The view was great and the sun set over the mountains while I was up there. I noted that the city has several elevated roads, speeding up the flow of traffic, although experience led me to discover this was at a cost. Streets tended to be laid out on a grid system in the city centre, less so on the outskirts, and many of the roads were quite long. Many Japanese cities suffered bomb damage, enabling modernisation, although Kyoto wasn’t much affected in this respect. Fires and earthquakes had been a bigger problem over the centuries. 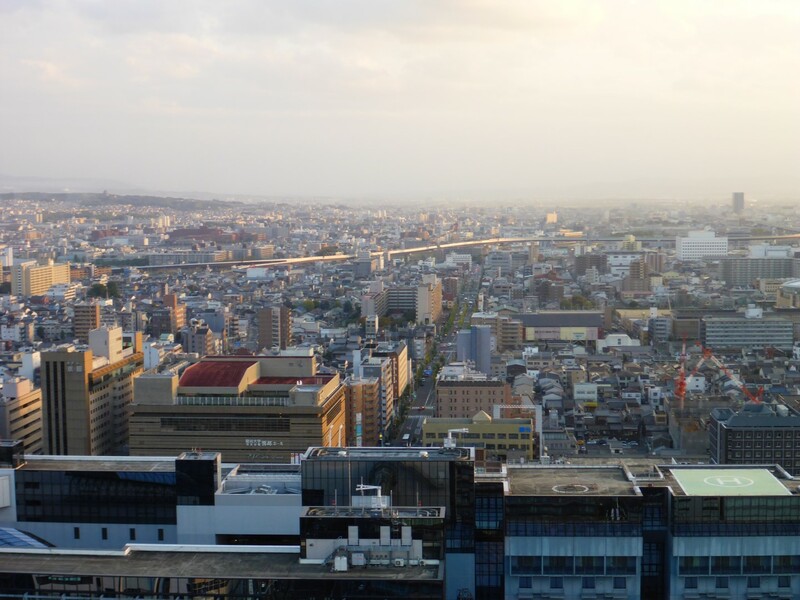 View over Kyoto from the 100 metre high tower. I’d been told about a couple of cheap, simple eating places by the hostel staff and one of them was a popular Ramen Bar. Ramen is a wheat based flat noodle served in a meat or fish broth, with added vegetables. It was a fast food place in that you got your food very quickly, you shared your table with others, or sat at a counter, and as soon as you were finished you left. There would usually be queues at busy times. Noodles with pork was what I chose out of only five dishes on the menu. The waiter brought me a fork but I used the chopsticks with a good degree of competence. The food was good, and Japanese don’t give, or expect, tips. Straight forward and easy. Time to get serious about some sightseeing so next day I headed out with a list of four places although I only got to three in the end. The first challenge was delivered by the GPS not taking me to the exact location. Somewhere between the mapping and the coordinates lay a mismatch. Usually of less than a kilometre but I invariably had to ask for directions. On one occasion this proved to be a real blessing. Doris desperately needed a service and a new rear tyre. The GPS took me to the wrong place but across the street was a Kawasaki bike shop. I parked outside and got chatting to a customer who spoke English. He spoke to the owner for me and I ordered a new rear tyre and arranged to come back a couple of days later to have it fitted. I would also be able to carry out the much needed service in his workshop. Every cloud has a silver lining after all. I also tried to order a desperately needed chain and sprocket set but my model of bike was never sold in Japan so no luck with that. So here’s an overview of the places I visited during my time in Kyoto. FUSHIMI-INARI-TAISHA. Inari is seen mainly as the patron of the rice harvest and also of business, the two having been intimately connected over the centuries. It is a large complex with many buildings, the main one of which was built in 1411. One of the noteworthy features of the site is the 4kms trail of Torii, which winds up and around the hill behind the main buildings. 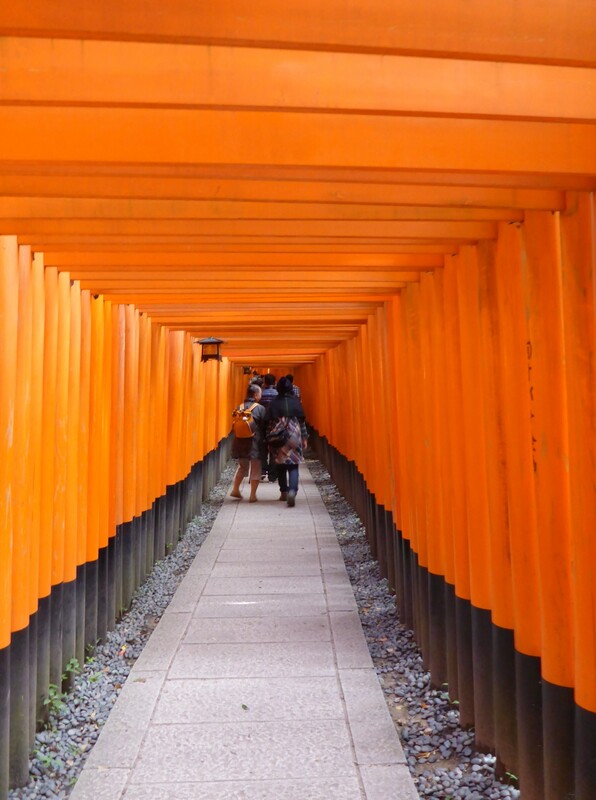 A Torii is an arch which can have dedications inscribed on its uprights. These are often paid for by businesses in the hope of being rewarded with success. There are thousands of them here and when I walked through them I couldn’t help but feel I’d walked inside somebody’s abstract art painting. The bright orange colour was very disorientating and they were very close together. 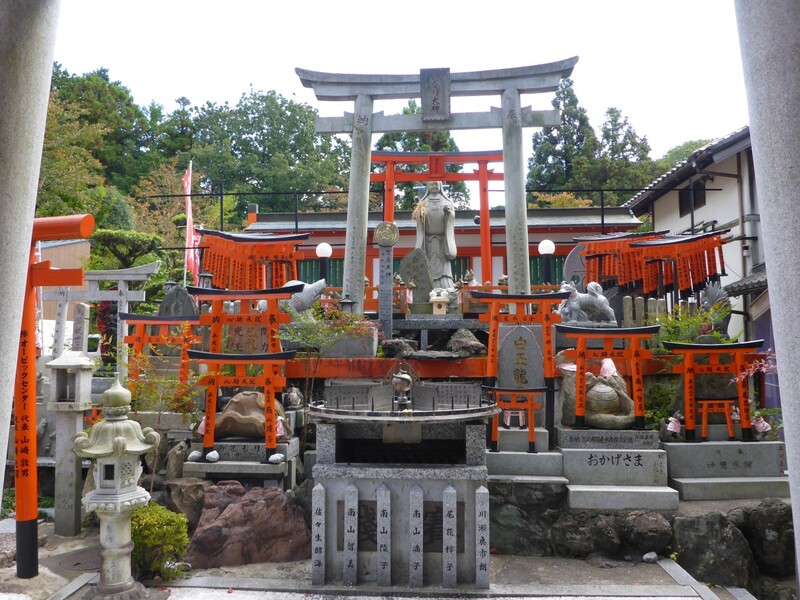 On the hillside were hundreds of shrines of various sizes and complexities, most featuring a fox with a key in its mouth, the key to the rice store. People will often put little aprons on the statues although I’m not sure why. At the main building you can pay for a small piece of wood on which you can write a wish. Once a month a priest takes them and makes a prayer on your behalf. I left one on behalf of a friend who is ill. She’s improving now. Make of that what you will. Part of the Fushimi-Inarii Temple complex. A Torii forest, and a strange feeling from being inside. One of the more exotic shrines. Foxes with aprons. It’ll be gloves now, as it’s winter. CHION-IN TEMPLE. This is the main temple of the Jodo Shu (Pure Land) sect of Buddhism. It was built in about 1640 after the original building had burnt down, a common story amongst these wood and paper buildings. 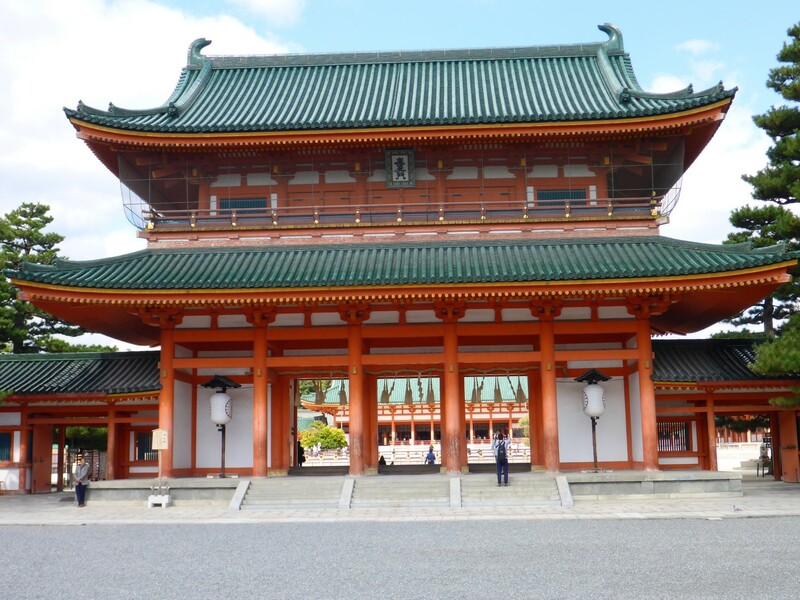 It has a huge and very decorative main gate and the main temple is also very big but was closed. The gardens are very nice but I was a bit disappointed overall. 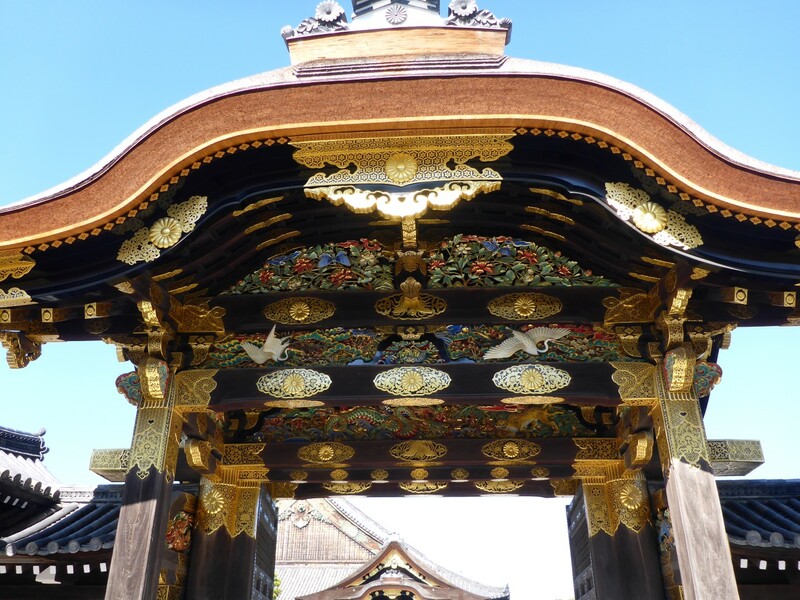 Elaborate gate to the Chion-In Temple. GINAKU-JI TEMPLE. This is a Zen temple and was supposed to have a silver pavilion. 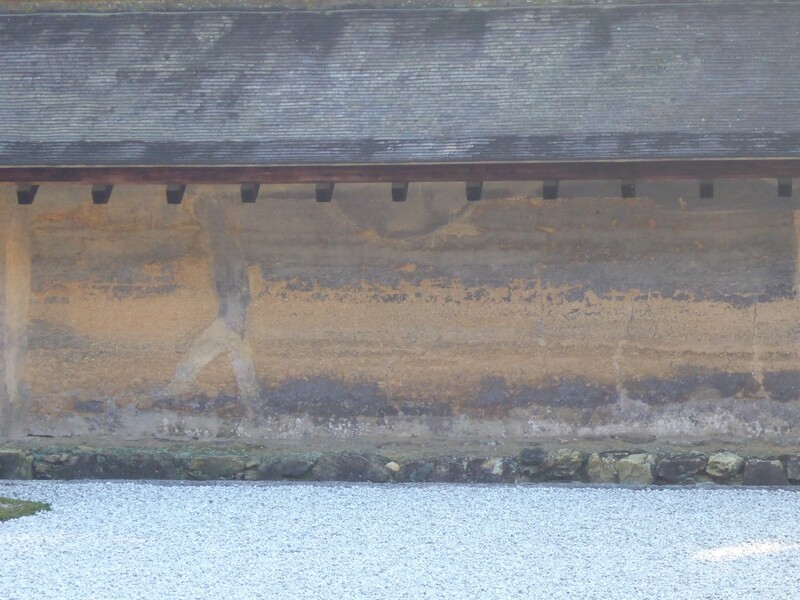 It was built by a retired Shogun Warrior but the work was interrupted by war. He died before it could be completed. I didn’t go inside because it was a long wait until the next tour. Once again I wandered around the formal gardens. All of the temples have these and they are invariably beautifully laid out with trees that either look very colourful or have a very unusual shape. They often appear to be very old judging by their spread and shape and look to me like giant Bonsai trees. Despite the crowds I found these gardens to be places of peace and tranquility, with an air of timelessness, and it wasn’t difficult to feel linked to strollers from previous centuries. ROKUON-JI TEMPLE. 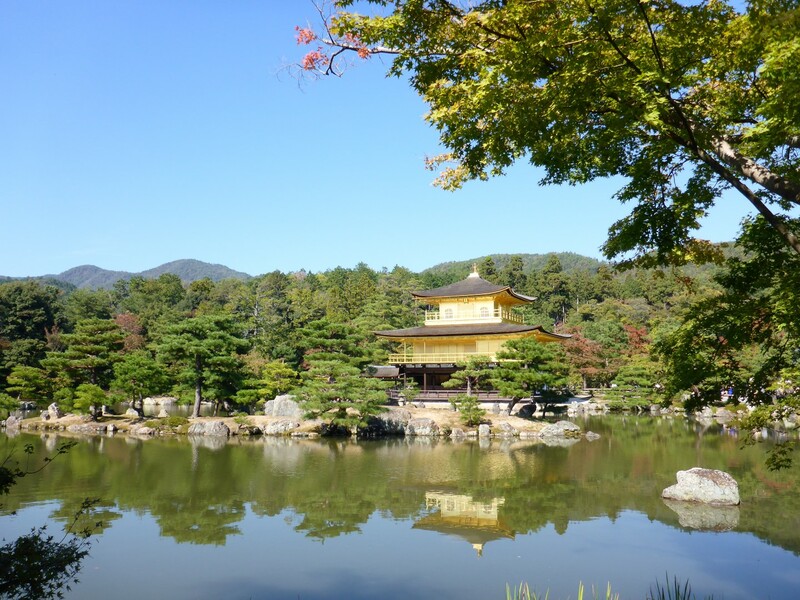 This is another Pure Land temple and its main attraction is the Kinkaku-Ji, or Golden Pavilion. This is a stunning building whose upper two storeys are clad in gold leaf. It was rebuilt following a fire, started by a disaffected monk in 1955. I was unable to go inside but that didn’t matter because its beauty lay on the outside. More than anything, it lay in the lake next to it and the way the building was reflected in the water. It looked stunning. 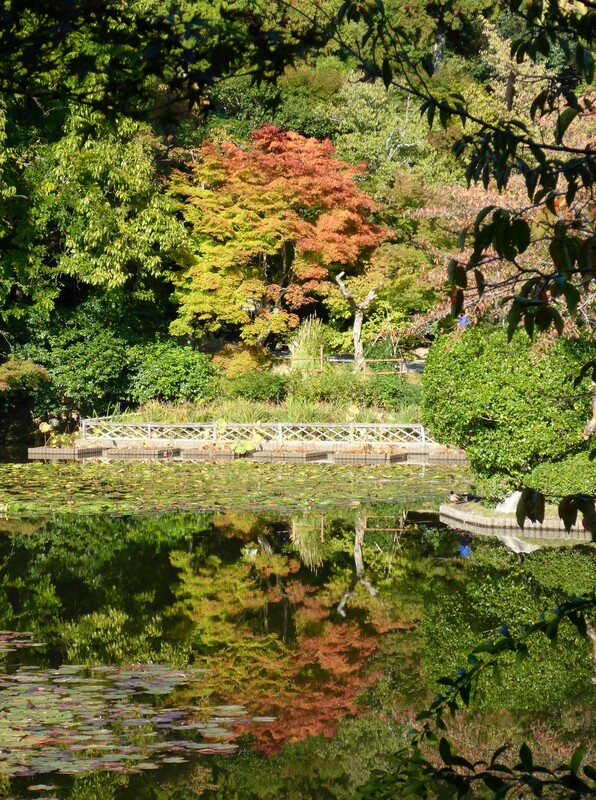 The gardens here were less formal but delivered their beauty via the colourful trees and their reflections. It was another great place to walk around. I’m guessing this tree is pretty old, judging by the need for support. RYOAN-JI TEMPLE. 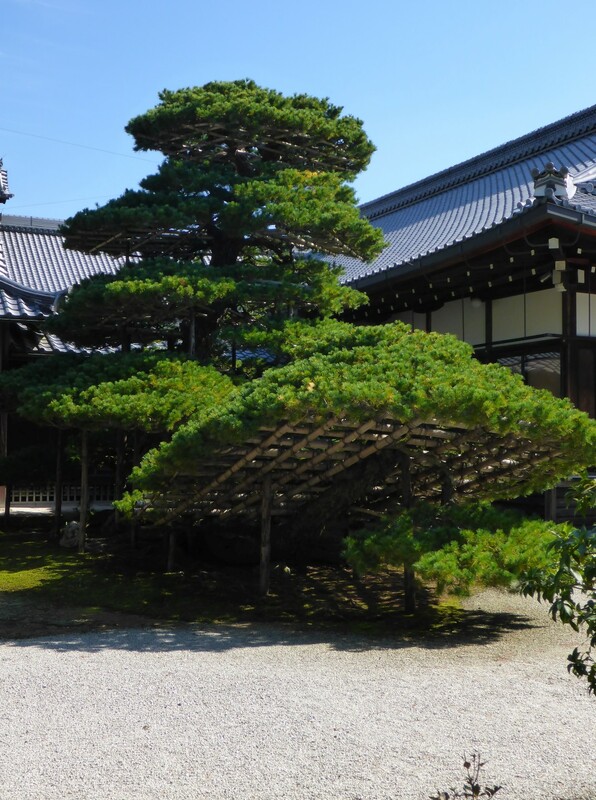 Another Zen Buddhist temple, this place is mostly famous for its Kare-Sansui (dry landscape) garden. It was created by a highly respected monk in about 1500 and consists of fifteen different size rocks laid out in a series of islands. They are surrounded by silver gravel which is raked into straight lines. It sits within an area 25 metres by 10 metres. 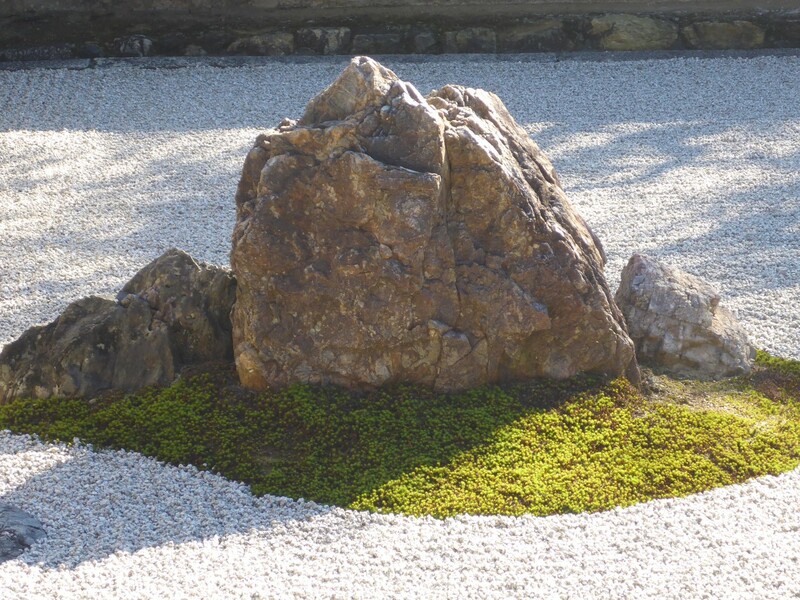 There are no plants apart from some moss around the rocks. There is no explanation of what they’re supposed to represent so, in typical Zen style, you sit and contemplate. They will come to mean something, eventually. Just rocks and gravel but you need to sit and think. Just a rock and some moss. Perhaps. The wall along the back of the garden is made from clay that has been boiled in oil. Over time the oil leaches out and makes patterns as it runs down the wall. I sat there and eventually saw something in the patterns that really got me thinking about life and its journey. I won’t say what it was but I left there feeling like I’d really got something out of the visit. I felt it was very special. And that’s the whole point of the place after all. As well as the rock garden there was a water garden. The sunshine helped to enhance its beauty by means of the reflections of the colourful trees on the lake surface. The whole complex was easily the best place I’d visited so far. There may be a message for you in there, if you look long enough. In a Japanese garden. Beautiful autumn colours. TENYRU-JI TEMPLE. 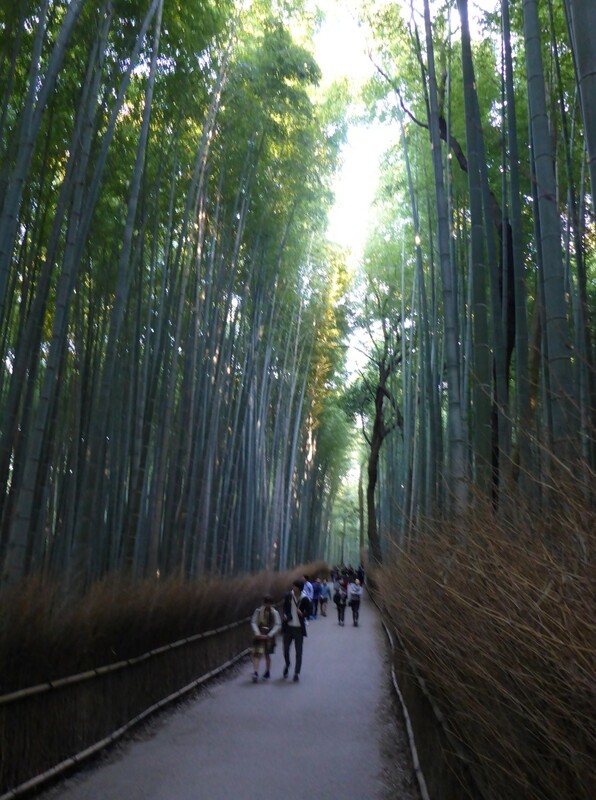 At this site the main attraction was the Arashiyama Bamboo Grove. The grove lies either side of a path and consists of bamboo trunks that are 10-12 metres tall. The trunks block out the sunlight and walking through them has quite an overpowering effect. It was definitely a weird experience. The temple buildings were closed anyway but, as in all the other temples, there were nice gardens to wander around in. Heading back to the hostel each day I was starting to enjoy my cross city journeys. Queueing drivers didn’t seem to mind bikes zipping by them, on either side, and I felt back at home in a busy city. I tried another Japanese dish at a chain restaurant called Sukiya. A bowl of beef and rice, some fish soup and salad, all for less than £3. I’ll be going there again! I successfully negotiated the rice/chopstick minefield and didn’t hear any laughter from my fellow diners. Result! 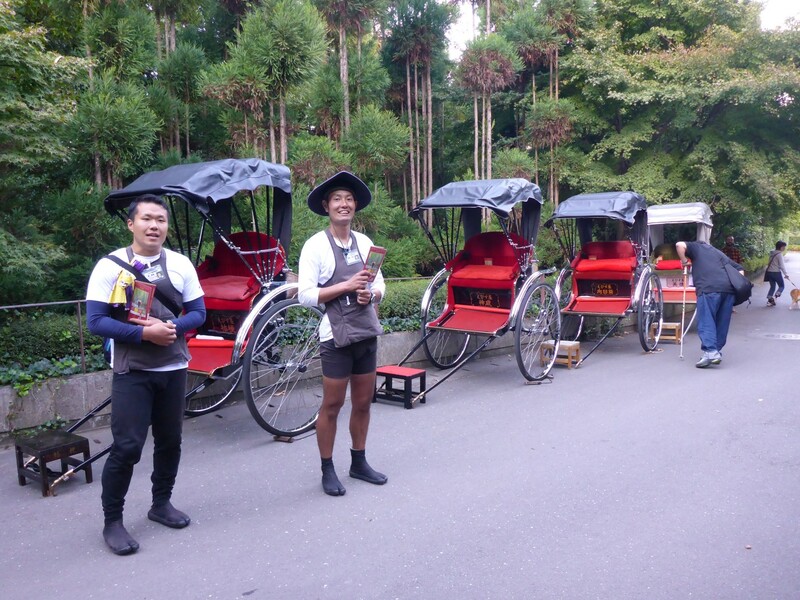 Rickshaws for hire near the Tenyru-Ji Temple. 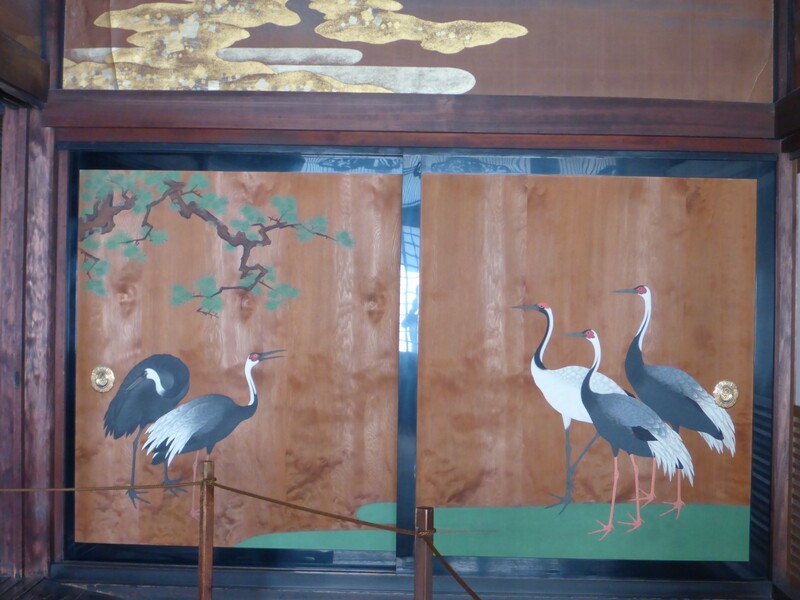 Superbly decorated gate into Nijo-Jo. Nijo castle was the place I was looking for when I found the bike shop. This time I knew where it was and after my visit there I was going back to the shop to get some work done. It’s what I think of as a proper castle in that it’s situated on a huge rock and it has a moat around it. 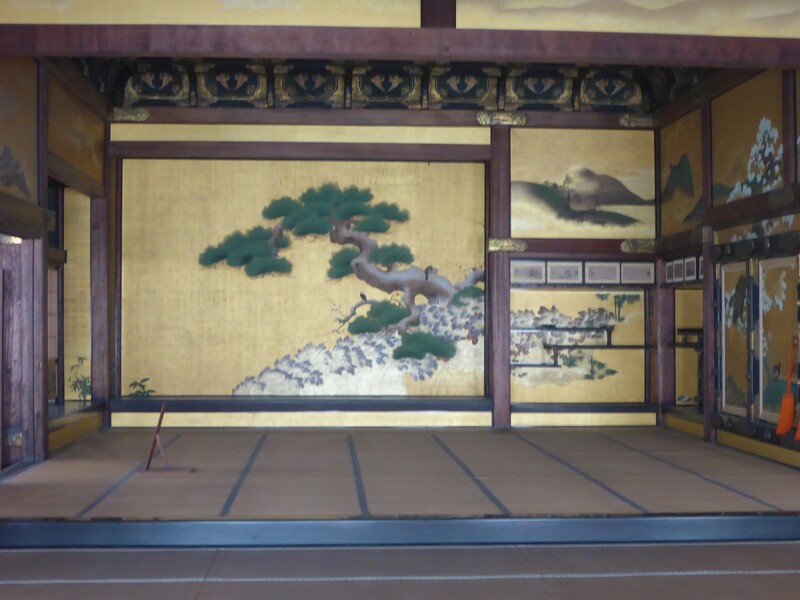 Built by a local Shogun in 1626 it has thirty three rooms, many with very ornate and important wall paintings, and large gardens around it. I disobeyed the rules and took photos of the interior and then enjoyed a walk around the gardens. 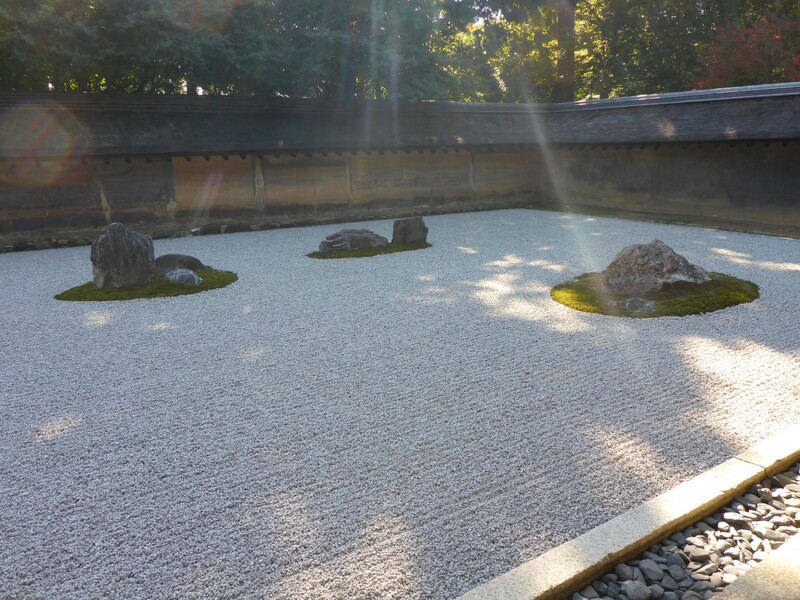 Most of the contents of formal Japanese gardens have some kind of religious or spiritual significance and although I mostly didn’t know what they were, it wasn’t difficult to appreciate the effect of them. Japanese art at its best. Back to more practical matters. I headed to the bike shop and spent the afternoon essential on maintenance. Although the tyre still had plenty of tread, I was concerned that the patch on the inside of it would give way, hence the decision to replace it. I’d decided on a Michelin T63, a nice, meaty trail style tyre, thinking it would serve me well when I got to the backwoods tracks of New Zealand. Yanagi Motorcycles is a small family business, with a husband/wife/son team. Friendly and helpful, they made everything easy and had all the bits I needed – bulbs, spark plug and a replacement screw for one that I’d lost, found within his box of odds and sods. A man after my own heart – never throw anything away because you just never know! Fantastic service but to be honest, I’m not surprised. 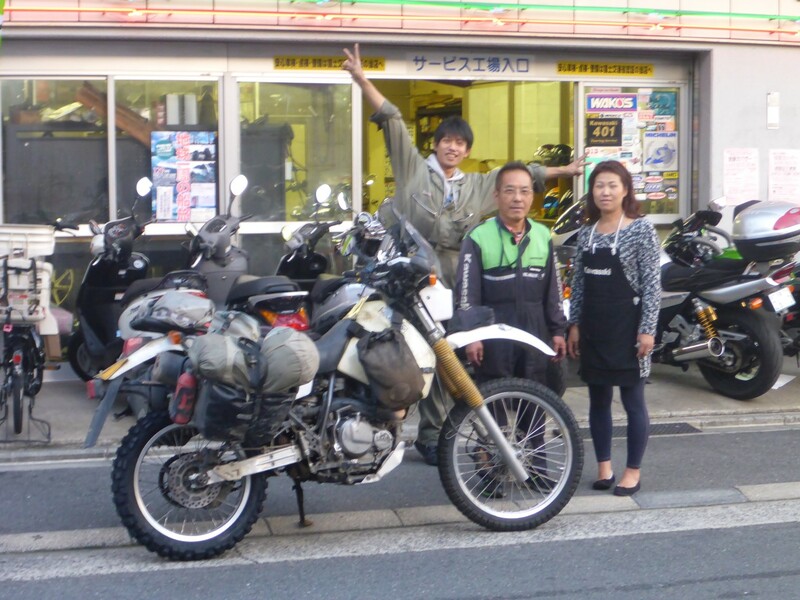 Yuya (son), Isao and Hiromi from Yanagi motorcycles. Having spent three days immersing myself in Kyoto’s ancient culture I rang the changes by enjoying something of its modern one. For my final meal in the city I headed back to the restaurant area in the Yodobashi department store. There was a variety of different types and price ranges but I chose one which I thought had a fantastic way of delivering service. On display outside were plastic models of each dish on the menu and examples of the plate sizes – small, medium or large. All I had to do was decide what I wanted and how much, put my money in a machine and press a button. It issued a ticket which I then gave to the young lady inside who passed it to the kitchen. Five minutes later my meal was delivered to my table. Condiments, chopsticks and water were already there. So quick, so simple. What a great system. 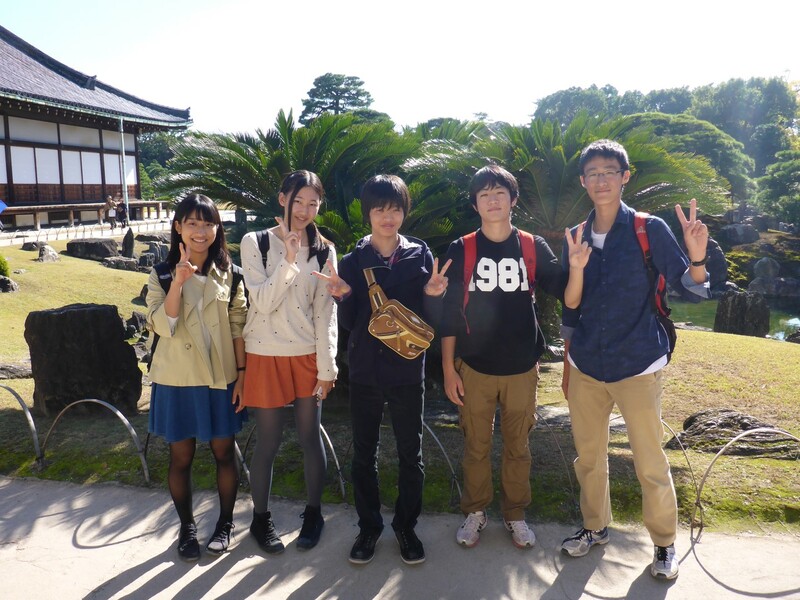 Peace loving Japanese youngsters. Friendly too. Time to move on. Kyoto had been a great place to visit on many levels. I’d learned much about Japanese culture, old and new, and had rubbed shoulders with lots of Japanese people in various ways. I had even started to learn some of the language. I felt confident and relaxed about exploring more of this lovely country. I think I’m turning Japanese, I really think so! Cheers Dave. I’m already working on the next one. 🙂 I’m at Fox Glacier and they keep cancelling my Heli-Hike, so I might as well spend my time constructively. Hey Geoff — good blog. Your pics of Kyoto remind me of my trip there 30 years ago, I hit some of the same tourist spots you did. More self-serve machines now though. Traffic was slow then too. Nancy still to go. Very nice people.